The official Ponderosa Stomp Vinyl Party! Dance to all vinyl 45’s from Stomp Disc Jockies from around the world! All 45s to dance all night! A decade after hearing Roy Lee Johnson’s ‘Busybody’ (Okeh) played by legendary record collector Kurt Wood on University of Georgia’s “Who Put the Bomp” radio show and attending a party marveling at his rooms of floor-to-ceiling shelves of 45s, Bossy Boots was poking around the dearly departed flea markets in Chelsea and suddenly felt compelled to look for that very record; thus a collector was born. Shortly thereafter, eBay was discovered, WFMU record shows were attended, and many passionate and long-time record collecting friends from all over the world were met, generating a frenzy of record-seeking, dj’ing and dancefloor adventures, from ModChicago, SF, Atlanta’s Rhythm & Booze, to NYC’s Debutante’s Ball, Subway Soul & Smashed!Blocked! 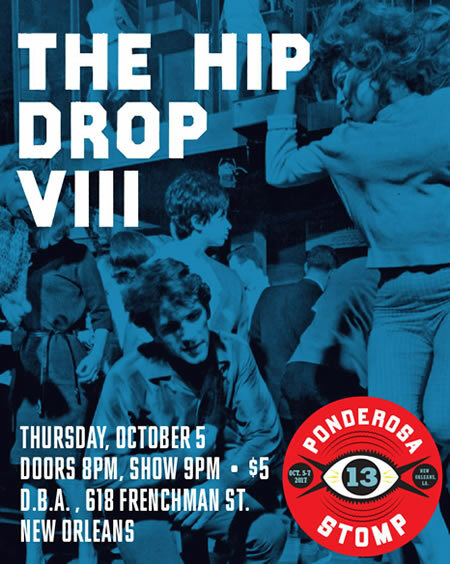 parties, and a monthly with Garage Hangover’s Chris Bishop, “Switched On.” Garage, Soul, R&B, Psych, and Freakbeat are all favored, and I’m thrilled to kick off the mood of the great Ponderosa Stomp Hip Drop! Aaron Levinson is a Grammy Award winning producer, musician, composer and record label owner. He has produced and released 26 albums since starting his career with Inner City Records in 1981. He also has written extensively about music of the Americas and is an engineer, arranger and educator. Lisa Nguyen, a native daughter of New Orleans, got her start in playing all-vinyl records in the Windy City. She forged a sonic alliance with founder of Mid-West punk records outfit Hozac Records, Todd Novak, to form H.A.D.S. (HozAc Decapitation Squad) and they played aggressive sets of punk, glam, power-pop, 60s garage, doo-wop, girl group, early 2000s era trash punk, soul, R&B, Prince and a whole lot more from 2011-2015. A hospitality professional by trade, she moved back to NOLA, and spends most of her time training bartenders not to stick their fingers in the drinks. Head honcho of Boogie Disease Radio and front The Savage Gospel garage rock duo. Played guitar with Andre Williams from 1996-2008. Spinning 60s garage a-Go-Go Freak Beat Psych Fuzz. Music Man Miles (aka Miles Tackett) is a Los Angeles native & in addition to being the man behind the Breakestra he's an all vinyl dj covering sixties to late seventies funk, soul-jazz, & vintage world rhythm sounds. He's also the founder of the 18 year running weekly FUNKY SOLE party & co founder of the long running Root Down hip-hop party. He currently is also releasing guitar based rock n' soul sounds & playing live under his own name. Detroit native Adam Stanfel is a full time collector incorrigible and a part-time party rock disc jock. An honors graduate of The People’s Records Institute of Music Geeketry and a member in good standing with the Hamtramck Chapter of the Mystic Knights of the Mau Mau, he has gladly lent his hand to a stunning number ill-fated cultural ventures within the Motor City. He is prone to poor esnipe decisions, and spends an unforgivable amount of time copying and pasting track listings into the Youtube search field. 30 plus years of idiocy did however land him in backing bands with many Fortune Records recording artists and a few cool dj gigs in cities even outside of the midwest. Expect a heavy dose of raucous r & b that Berry Gordy would have turned his nose up at, and blues blasters from the factory floor, and even maybe some (gasp) northern. Sheila Burgel is a New York-based record collector, DJ, and music journalist. She has produced and written the liner notes for several compilations including Rhino Records’ Grammy nominated One Kiss Can Lead Another: Girl Group Sounds Lost & Found box set and Ace Records/ Big Beat’s ’60s Japanese girl-pop compilation series, Nippon Girls. She also edited the critically acclaimed photography book, Dust and Grooves: Adventures In Record Collecting, founded girl-pop web magazine, chachacharming.com, DJs her record collection all over the world, and currently hosts radio show “Sophisticated Boom Boom” every Friday from 3pm-6pm EST on WFMU, the longest running freeform radio station in the US. Jason Stone is the host of “Get on Down with the Stepfather of Soul!” on RockinRadio.com, which he has hosted for the past five years. He is also the author of The Guardian-recognized blog of the same name, which now focuses on ‘60s and ‘70s soul radio airchecks, and occasionally spins soul, funk, jazz, blues and gospel in Atlanta for the “Rhythm & Booze” soul night. The Rum Cove left the UK 30 years ago due to his need to experience Washington DC’s native Go-Go music live. His 40 year love affair with Vintage R&B bought him to the University of Virginia’s WTJU FM station where for the last 17 years he has hosted ‘The Soulful Situation’ broadcast, concentrating on the sounds of Southern Soul. He has interviewed many recording artists and authors on his show in furtherance of his quest to ensure that great Soul Music is never forgotten. His last appearance at The Hip Drop was with Brother Breakdown, the other half of the long running DJ team Grits and Gravy, in 2011. Host of the long running Soulgroove ’66 radio show in PBS fm in Melbourne. Long time club DJ, photographer, and Stomp regular! Purveyor of Rock N Roll of the 50s and 60s on wax, WTUL DJ, Girls Rock Camp organizer and Domino Sound record slinger! Being a life long digger and music lover has ultimately lead to Brewerytown Beats record shop in Philadelphia. After two years in business selling “stax o’ wax”, a collaboration between Brewerytown Beats and Jamie Records formed, and we have remastered and re-released several records from the Arctic and Phil L.A. of Soul record labels. This collaboration has peeked my interest in Philadelphia music, and i have been able to dive deep into the history of Philadelphia music using my access to collections and the people who made Philly Soul/Funk music happen. Enjoy it with me. Ben Shive is a native NOLA funk curator. Specializing in classic and rare grooves from the 60’s to 80’s. You can catch him every Tuesday for Soul Rotisserie at Handsome Willy’s from 5-9 dropping all 45’s along side the SR crew. WFMU, Telstar Records, Maxwell’s – A veteran of multiple Hip Drops Todd is known for a special breed of wild Rock N Roll on the turntables. Todd is known to many from his days at Maxwell’s Hoboken and as the head honcho of the famed Telstar Records.